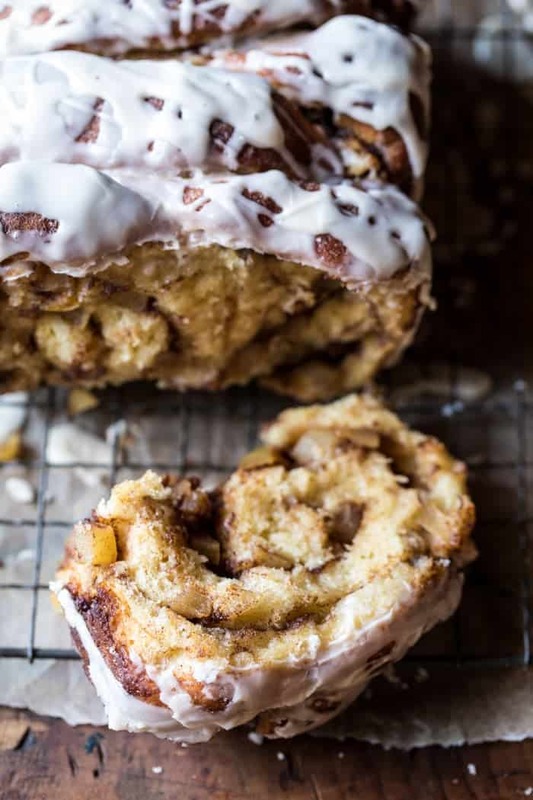 No better way to welcome the weekend than with this sweet maple glazed apple pull-apart bread. I wish I had words for just how delicious this apple bread is. It’s one of those recipes you just crave on cool fall mornings, or at least I do anyway! 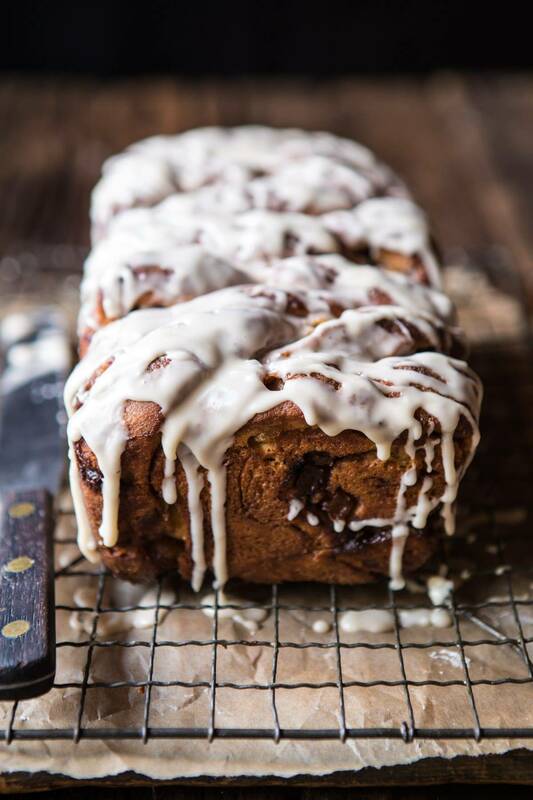 This bread is all things sweet, ooey, gooey, applely, cinnamony, and basically so amazing…especially when warm out of the oven. It’s currently my go-to bread recipe when entertaining or just needing something sweet to bake up on Saturday or Sunday morning. Speaking of mornings, I spent the past two and a half days in very sunny and very warm LA, where fall has not quite hit yet. This was ok by me though, as I loved the warm air on my skin. Sadly I was inside most of the time, but the breaks outside where greatly enjoyed. I was in town filming for Hallmark Home and Family, which if you missed it, can be seen online here. I also did some work with my friends at My Domaine. I’m headed home today, and totally looking forward to some weekend baking. It was short but fun trip. I got to see my brother Malachi’s new house and spend some time with him before he heads off to Europe to do some filming with my youngest brother Red for the upcoming winter Olympics. Not gonna lie, a little jealous of my three brothers all romping around Europe. Red is there training now, but Kai is meeting him in two weeks. 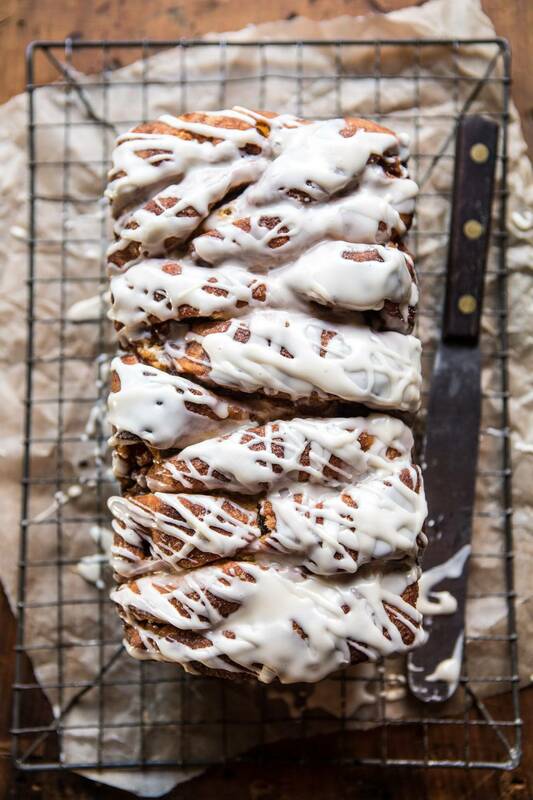 On to this yummy pull-apart bread. The base of the bread is an extra soft brioche dough. It’s a simple dough with a good amount of eggs…and butter. It’s my favorite base dough recipe to use when baking up sweeter breads. 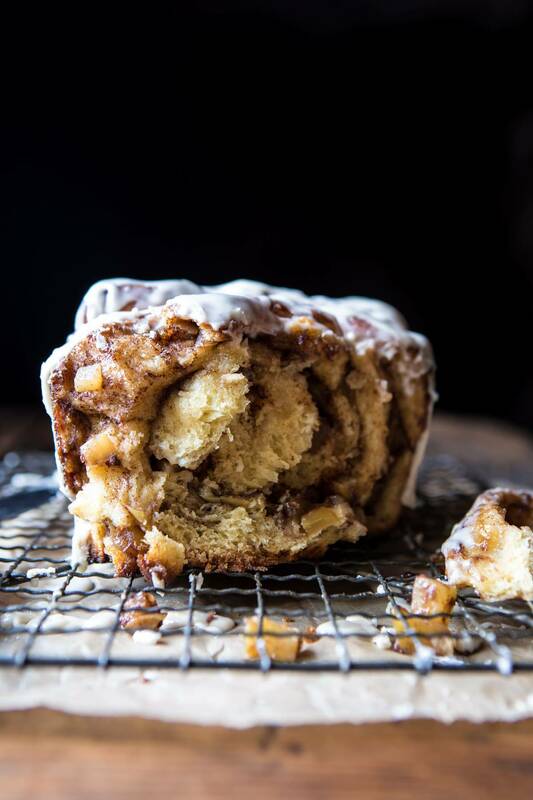 I used this base dough for the cinnamon roll recipe I have in the cookbook…you should probably try that recipe too. YUM! The dough is a quick mix up, then you’ll need to let it rise for a bit. The key to this recipe is the filling, and that oh so sweet glaze. 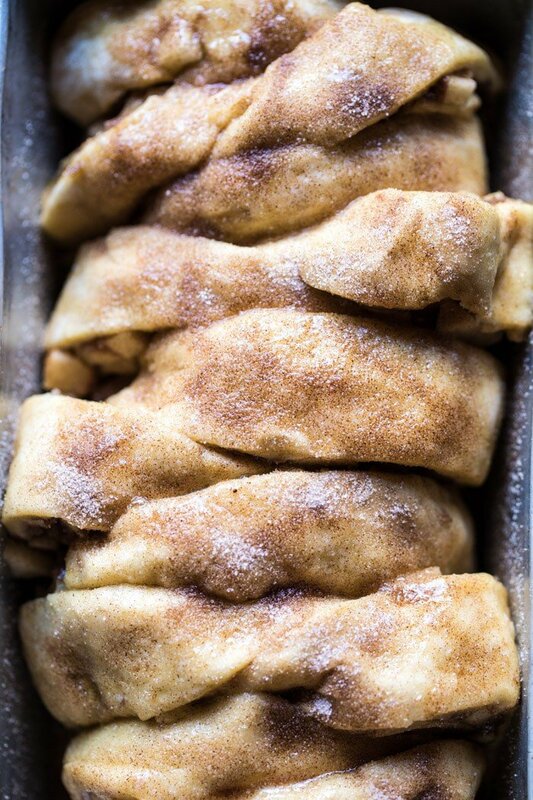 The filling is made with cinnamon sugar and studded with crisp Honeycrisp apples. 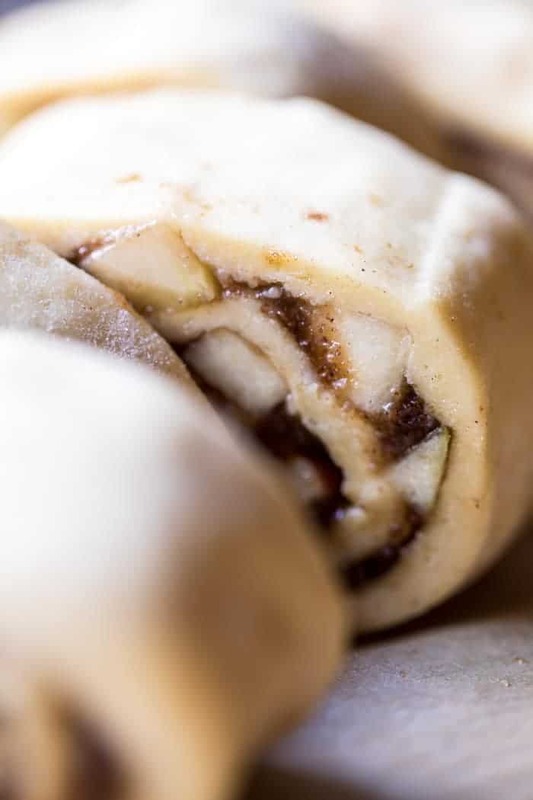 Very similar to a cinnamon roll, but just with apples, and I might even like it better. I mean, don’t apples make everything better? Roll the dough up into a log, cut pieces off into rounds, and then layer them into a bread pan. 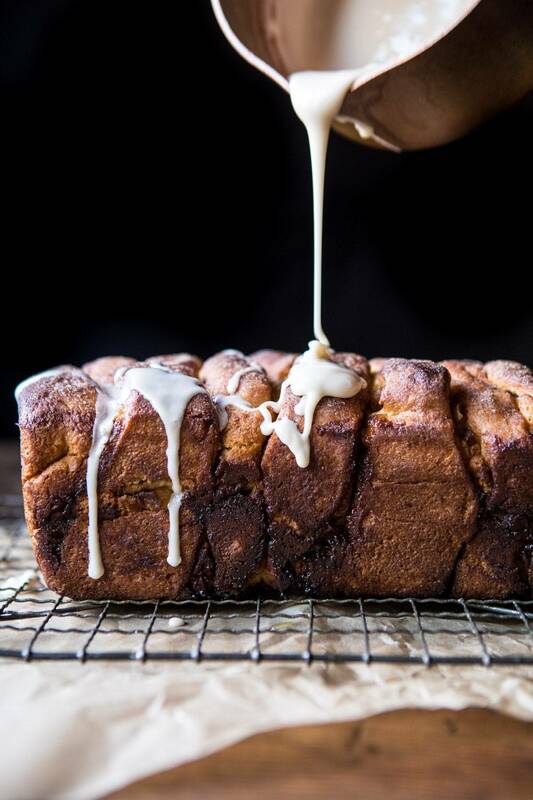 Bake and top with a sweet maple bourbon glaze. Yes, yes, yes. Maple bourbon…how delicious does that sounds. It’s the secret to the warm and cozy fall vibe this bread gives off. It’s delicious when generously drizzled over top of this bread. The only way to make this pull-apart bread even better? Serve it alongside a steaming cup of tea, coffee, or hot chocolate (whichever is your favorite) and enjoy it on a crisp and cool weekend morning. It really doesn’t get better…or more on point for fall. Meaning this bread needs to be on your weekend baking list. This bread is all things sweet, ooey, gooey, applely and cinnamony...pretty much just amazing...especially warm out of the oven. The perfect bread for a fall weekend morning! 1. To make the dough: Combine milk, yeast, and sugar in a large mixing bowl and mix on low speed until incorporated. 2. Add the salt, eggs, and melted butter and mix until combined. Gradually mix in the flour until the dough comes together and pulls away from the side of the bowl. The dough will be sticky. Remove the dough from the bowl and place on a lightly floured surface. Kneed into a smooth ball. Grease a large bowl and add the dough to the bowl. Cover the bowl with plastic wrap and let sit 45 minutes-1 hour or until the dough has doubled in size. 3. Meanwhile, make the filling. Add the brown sugar and cinnamon to a bowl and mix well. 4. Lightly dust a surface with flour. Once the dough has doubled in size, punch the dough down and roll the dough into a rectangle (about 9x24 inches). Drizzle half the butter evenly over the dough. Sprinkle with half the cinnamon sugar. Arrange the apples over the cinnamon sugar, then sprinkle with the remaining cinnamon sugar and drizzle with the remaining butter. Starting with the long edge closest to you, pull the edge up and over the filling and carefully roll the dough into a log, keeping it fairly tight as you go. When you reach the edge, pinch along the edges to seal. 5. Place the log seam side down on a baking sheet lined with parchment paper. With a pair of sharp kitchen scissors cut diagonal slices almost to the bottom of the log. Arrange the cut sections so that they lean to alternating sides. Use your hands to gently push the dough together to almost the size of you bread pan. The dough will zigzag slightly. Using the parchment paper, lift the dough up and into the bread pan. If using a bread pan smaller than 9x5 inches, divide the dough among 2 bread pans. Cover and let rise in a warm place for 45 minutes to 1 hour. 6. Preheat the oven to 350 degrees F. Place the bread on a rimmed baking sheet and bake 45-50 minutes or until lightly browned on top, do not over bake, this bread is best when still doughy. 7. To make the glaze. In a medium bowl, whisk together the maple syrup, powdered sugar, and bourbon, if using, and vanilla. If needed, add water to thin the glaze, 1 tablespoon at a time. 8. Serve the bread warm, drizzled with the glaze. Leftovers are great the next day! But then you knew that, because how could you resist all that deliciousness up there? So so good! Ahh, such an awesome Home & Family segment! So glad you were able to return to the show in person 🙂 And I love that Henry Winkler was there – hello, Happy Days nostalgia. 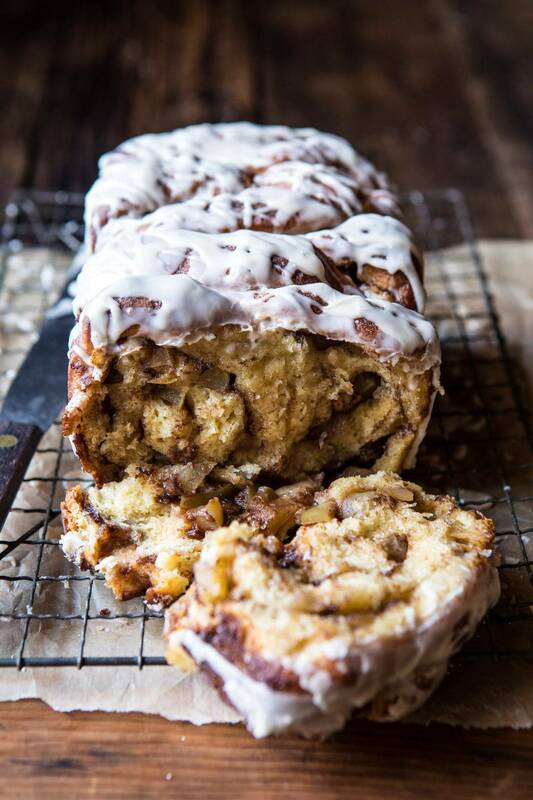 Lastly, this apple bread recipe = perfect fall treat. Happy almost weekend, Tieghan! Thank you so much Liz! I hope you have a great weekend! This looks delicious! 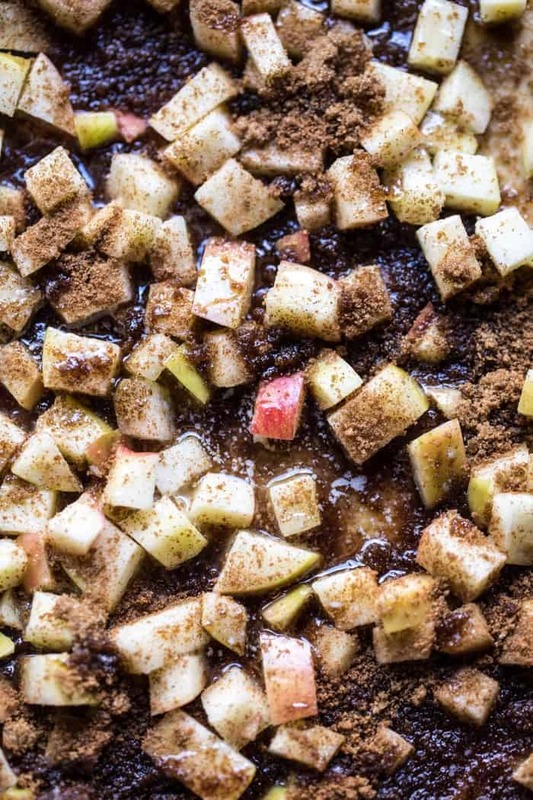 In the photos it looks like you roasted or sautéed the apples before adding. Have I missed something? This looks delicious! In the photos it looks as though you roasted or sautéed the apples first. Did I miss something? Hi Katie! No need to cook the apples, I do not cook mine. Let me know if you have other questions. Hope you love the bread! This looks so decadent, yummy and amazing. Yup, everything is better with apples (and bananas.. and cheese, obviously..). I like the apple-cinnamon combo in my yogurt bowls plus, I would definitely sneak some nuts into this – walnuts or pecans, that would pump up the game! Breathtaking photos, by the way, love them! The one with the running glaze? On point! Have a wonderful day, Tiegh! Yes everything is totally better with those three things haha! But feel free to add some nuts to this when you make it, I am sure it will be great! Thank you so much! I hope you have a great weekend! I’d like to make this, but I’m uncertain about step 5 (cutting and arranging the slices.) Can you clarify or show pix of the process? I’ll give it a try anyway, but I’d like to have a better idea of how that part is supposed to go. BTW … the cranberry roasted chicken was wonderful! I also am not entirely clear on the directions – maybe this would be a good one for a video? I’m confused too! What do you mean by cut ithe slices almost to the bottom of the log? Does the parchment go into the baking pan? Help please! Hi! I’m having trouble accessing the video- it says “for the video- click here:” in the recipe, but there is no link to click. I checked on both my computer and phone, but still haven’t been able to see the video. Hi Lucy, I am not sure what the issue is as I can see the video fine. I am thinking it’s your internet, but what browser are you using? So sorry for the trouble! BTW … I was using Chrome and also tried MS Edge. Neither one had a link that I could find. 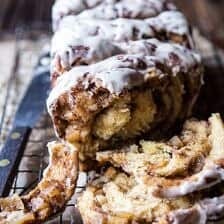 You can look at the cinnamon pull apart recipe there are pictures at the bottom showing how to cut it. I put parchment in my pan overhanging on both sides then just squished the dough together and put it in. Came out perfect! So I was pretty confused about this step too but I thought I’d just dive right in and try it! It was way easier than I thought! I rolled it up, put it on a piece of parchment paper and used a bread knife instead of scissors to cut it. My sections were about 1.5 inches thick and I didn’t cut all the way through. After all of it was sectioned off I started at one end and pushed one section back and pulled the next forward (gently of course). It takes a bit of maneuvering but it’s actually quite forgiving dough. Just make sure you’ve rolled it tight enough…I can see the filling coming out if you don’t. After that I pushed it together into more or less a bread pan shape and voila! Just don’t be afraid to handle it…as I said, it’s quite forgiving and easy to shape. Have fun!! Definitely on my weekend baking list! Can I make this the night before and bake it in the morning? How would you recommend I do that? Thanks! I’ve made this a couple of times. I tried this and I would not recommend baking it the next day. I think the apples make it too wet. It took 85 minutes before the center wasn’t raw anymore and by then the outside was too brown even though I tented it with foil. It also did not rise as high. Overall the results just weren’t as great as making it and baking it the same day. Wow that sounds so amazing! I hope the wine festival is going great Linda! I hope you love this bread when you get the chance to make it. Thank you! Hi Erin! No need to cook the apples, I do not cook mine. Let me know if you have other questions. Hope you love the bread! Love this recipe Tieghan! And your new site looks stunning beyond words! Absolutely gorgeous! 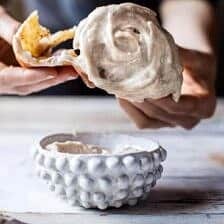 Esse pão parece muito bom e saudável leva maçã,ideal para mim gostei muito da receita. Obrigado! Estou tão feliz que você gostou disso! I’m not having the best day (even though it’s Friday… geez! ), and I’d love to eat like the whole loaf of this about now. That’s so cool what your brothers are up to… your family sure is talented. Will we be able to watch Red on TV in the Olympics? Hey Natasha! I am sorry to hear you aren’t having the best day. I hope the rest of your weekend is amazing! Yes you will be able to watch the Olympics on TV! 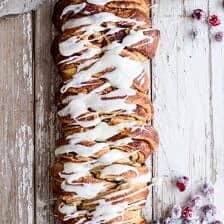 Can you do this as an o etnight revioe, as written in the cinnamon roll pull apart recipe? Hi Kristin! I am so glad you’re loving this bread! Thank you so much! 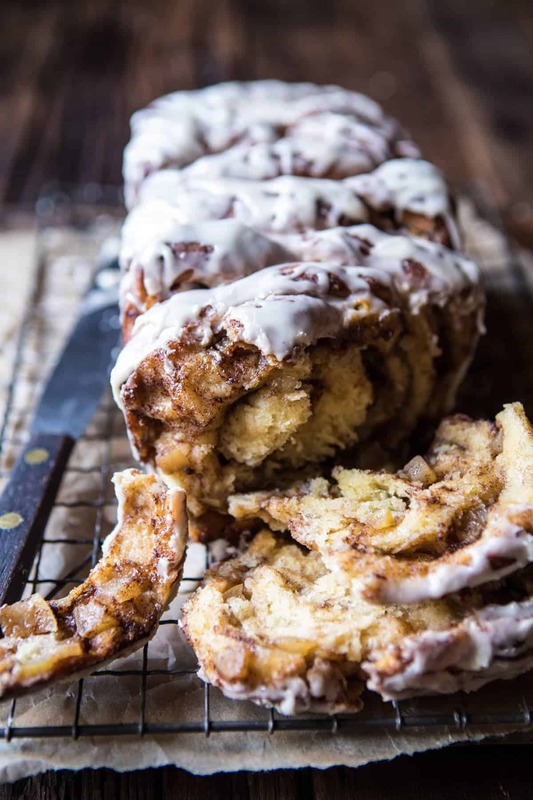 Pull apart bread is one of my favorite treats! It’s easy to make and oh so fun to eat! I love this version with apple and maple – Yum! I completely agree! I hope you love this Allison! I knew I had to make this as soon as you posted earlier this week! My bread’s currently on its 2nd rise in the bread pan, but I’m a confused about the baking instructions. Should I take it out of the bread pan and put it on a lined baking sheet to bake, or should it stay in the bread pan? Thank you thank you! Hi Cassie! Leave it in the bread pan, but put the bread pan on a baking sheet to catch any drips. Let me know if you have other questions. Enjoy the bread! This is so good! My kids are eating it off the cooling rack. I’m new to your site and bought your cookbook on a whim. No regrets! I made your no guilt alfredo last night. Fantastic. My pickiest eater ate it. Thanks for so many great new recipes! That is amazing! I am so happy you like the book & this bread! Thank you Catherine! Are we supposed to knead the dough for a certain amount of time? I know kneading is often a crucial step, but this says to just shape it into a ball and let rise. Hi Katie, no need to knead the dough, just roll into a ball and let rise. Please let me know if you have any other questions. I hope you love this recipe. Thank you! Oops thanks Kayla! I hope you love this! Great! I am so glad you liked this Lauren! Thank you! I made this last weekend to eat while watching Stranger Things – it is the PERFECT fall treat. Absolutely delicious and easy too! The only downside was that my husband and I ate almost the entire thing in two days… I think next time I’d better halve the recipe, or make this when I have friends over! Haha wow! I am so glad you loved this! Thank you! Really great , made this last week! Easy to do. All kids liked will make again. We couldn’t stop eating it. That is amazing! I am so happy you and your kids loved this! My kitchen smells divine. This bread is so delicious. It looks amazing too. I love to bake even though it’s a little time consuming. I find it very therapeutic. My family loved it and it barley got to cool down before we started to eat it. I also made your easy pull apart rolls, they were delicious too. Thanks for the great recipes, I’m a total fan now! Thank you Julie!! 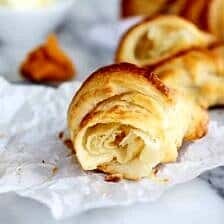 It makes me so happy to hear that you loved this bread recipe and the rolls! Hi, this is my second time making this and each time the dough rises like crazy! It’s basically tripling it’s size! I can’t figure out what I am doing wrong. This time I forced it into the loaf pan and it spilled over as it was baking…that’s how much it rises. 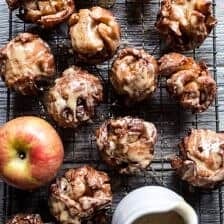 Could you use dried apples for this recipe? I have some that I need to use and would love to use them for this recipe. Do you leave the bread on the parchment paper when placing it onto the baking sheet? Just tried this recipe today and I’m so happy it turned out so so great!!! I’ve never made any kind of bread before and never used yeast in a recipe before either so my confidence wasn’t very high. However, the directions were easily to follow and the link in one of the previous comments to the video was super helpful. I actually kinda messed up and forgot to layer in the 2nd half of the cinnamon/sugar mix. Didn’t realize until I had already cut, staggered, and fitted everything into the loaf pan. I opted to just sprinkle it on top and it still turned out awesome. ,myself, ate like a third of the loaf (probably gaining a pound in the process). I am so excited to try more of your recipes!!! And a note to anyone trying this…the apples are just layered in raw (not precooked) and they turn out perfect! They soften in the baking process but retain structure…they are soft but not mush so don’t overthink this and just layer them in…it works! I am so glad this turned out so well for you and you loved it Beata! Thank you so much!